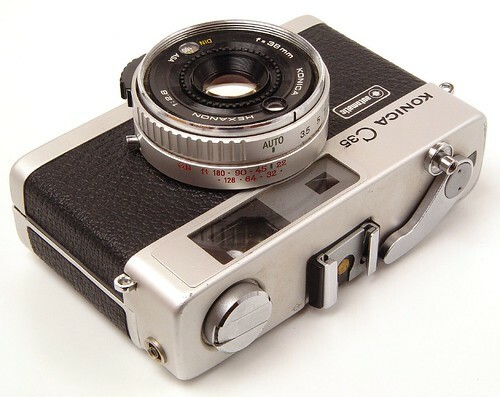 The Konica C35 of 1968 is a 35mm camera and first of a series of four cameras from Konishiroku that are dealt with in this article, the others being the C35V (C35E&L), C35 Automatic (C35 Flashmatic), and Auto S3 (C35FD). The Konica C35 EF is dealt with in another article. 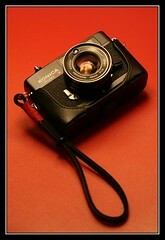 The Konica C35 was the first of a number of compact cameras that swept the marketplace in the early seventies. Cameras from other Japanese companies after 1970 (see photo at end) show its importance and influence. Its appeal to the general public was obvious from the start: it was a compact, light and simple to use camera with an excellent lens that was distinctly wider than average for the time and that took good photographs because it could be focused accurately. It was an outstanding sales success throughout the world. Konishiroku may at first seem a mere follower of fashion, updating the design theme of the compact Minolta Minoltina S and Olympus Trip 35, or even its own Konica Eye of 1964. However, the C35 was much more than an update: it brought together a number of other desirable design strands into one camera, not simply light weight and compact size, but a CdS meter in the lens mount (eliminating worries about filter correction factors), a rangefinder and most importantly of all, the simple operation of "auto only" exposure. The same basic chassis then had a different shutter/lens assembly incorporated and emerged as the upmarket (and considerably more expensive) shutter-priority Konica C35FD in Japan in 1973. This camera was available in silver or black and had an identical top housing to the standard C35. Other than the f1.8 lens, the only visible change was the replacement of the "Automatic" badge with the "FD" one. In all other markets this camera was sold as the Konica Auto S3 in a black anodised finish (not paint) A name and colour change made, obviously, to distance it from its cheaper brethren. Miyazaki Shigemoto (宮崎繁幹). Konika kamera no 50nen: Konika I-gata kara Hekisā RF e (コニカカメラの50年：コニカI型からヘキサーRFへ, Fifty years of Konica cameras: From the Konica I to the Hexar RF). Tokyo: Asahi Sonorama, 2003. ISBN 4-257-12038-X Pp. 61–6.